This installment of the class-centric Porphyra-series clocks in at 39 pages, 1 page front cover, 1 page ToC, 2 pages of SRD, leaving us with 35 pages of content, though it should be mentioned that the file adheres to an A5/booklet-style size at approximately 6” by 9”. So, let’s take a look! But before we do, I’ll have to ramble a bit about the Gunslinger. You see, when the class was released back in the day, I loved some of the design-decision. Grit-regains rewarded players for doing cool things and the class looked pretty neat. In play, though, several issues soon became apparent. The first of these would pertain lack of player choice: There simply is not much to choose and while 3pp-deeds helped here, the matter of fact remained that one gunslinger would pretty much feel like the next. That would be issue number 1. Number two pertains the price of ammunition – these guys’ weapons are expensive and when tested in low-level gameplay with strict gold-restrictions, the class proved to be a drain on the scant resources allotted to the group. Another issue pertained action economy – with reloading taking actions AND the potential to misfire/explode, we had one session where an unlucky gunslinger failed to shoot a single bullet…he was always occupied with fixing his gun or reloading. Finally, the class, to be honest, does not need full BAB. The touch AC means that even moderately competent gunslingers will pretty much hit anything in that range – 3/4 would have easily sufficed there and more utility would have made the class more rewarding. So that would be where I’m coming from regarding the gunslinger and it is these observations that informed my design of the etherslinger class for Strange Magic. It’s been a while since I saw a dedicated gunslinger supplement and I heard that this would address some of the issues of the class…so let’s see if it does. One note regarding the verdict – I am NOT expecting the pdf to address my own observations and will judge this in relation to the class, not what I think it should be. I just wanted to contextualize my own position. Got that? Great! We begin with alternative deeds (addressing player agenda concerns) – these may not be used to replace deeds granted from archetypes, but other than that, they very much are freely available for your perusal. Number one of these deeds already eliminates the feat tax and crappy action economy of the class – as long as you have 1 grit, you may reload as a free action – while this obviously represents a power-upgrade for the class, at the same time, it makes the class play so much better…so yeah, good with it! Similarly, there is one that duplicates Rapid Reload, so no, that’s not just rationalized away either. Dedicated specialist unlocks the vigilante’s signature weapon talent for firearms and gaining Endurance and Diehard for prereq-purposes (with limited usefulness tied to grit), unlocking quite a few options from the get-go that would otherwise be locked beyond the feat-tax. Getting ranged feint shots from the get-go also helps establish some basic gunslinging tropes from the get-go. There would also the option to TWF, with one weapon being a firearm, allowing for decreased accuracy for better damage. What about Point-Blank Shot or Precise Shot from the get-go. At 3rd level, deeds provide means to go ranged disarm, Deft Shootist…well, or expend grit to reduce a target’s armor’s efficiency…which, while powerful, is an intriguing option. The deed specifies the need for repair for the armor damage, but I’d frankly love to know whether mending suffices. 3rd level Deathless Initiate or Shot on the Run are early…but once again, I am pretty okay with the availability, since the selection of feats thus unlocked allow the gunslinger to do what he’s supposed to do…and that imho never was standing around, reloading, but running and gunning and being a badass. Speaking of the mobility angle: At 7th level, with a bit of grit, you can use Gunrunner with a full attack. Ranged dirty tricks within range increment number one, finesse shot and a reduced misfire rate can also be found here. Starting at 11th level, you may enhance your pistol-whip or combine gunslinger’s initiative with an immediate action attack for some serious Lucky Luke slinging! Adding some minor damage to combat maneuvers, following up on targeting…the deeds here make amply use of vigilante tricks and expanded that fit the gunslinger, while also making use of the feat-chain tricks that I expected from the book…nice. At 15th level, Dirty Trick master, Parting Shot, +1 shot (for 2 grit that may not be reduced)…pretty neat. And yes, before you ask – there are some deeds that obviously build upon one another. 19th level provides 3 deeds, one of which deserves special mention: On a failure, the target loses any SU, SP or spells for 10 minutes. As a minor nitpick, I think this severance should probably be SU…but I *get* why it’s Ex…being so mundane you disrupt magic…get it. Kinda like it as well! After that, we’re up to the next section, which would provide firearm modifications. Only non-broken firearms may benefit from a modification; the first one costs 250 gp, and every one past that clocks in at +1000 gp. Now I have seen some excellent rules for various firing mechanisms and the like in Fat Goblin Games’ Call to Arms-series/Vathak…however, the material herein allows you to basically add them relatively easily into the context of any other sub-gun-rule-system you may be employing: Basically, the modifications doe a lot of imho necessary things and some that are tweaks to the base weapon: You can, for example, increase the threat range by 1…but for balance’s sake, that decreases the crit multiplier by 1. Anyone who’s played a gun-using character in an infiltration-heavy campaign (or who has a GM like yours truly who keeps throwing scenarios at the PCs where charging in, guns blazing will get everyone killed) has gnashed his teeth at their sheer loudness – it’s why I build a Stealth-option into the etherslinger. Well, guess what? Silencer-rules. Sure, they’re still not as silent as shooting bullets of ether, but I’ll take them! Rifled barrels that decrease damage, scopes…you can make some seriously specialized guns with these tweaks. Nice! Similarly, further decreasing of misfire very much is possible with these mods. I do also enjoy the alternate materials for guns of mithril, adamantine, etc. – though I frankly don’t get why cold iron guns have a longer range. That one left me a bit puzzled. Now obviously, this pdf also features archetypes and the first of these would be the black powder duelist – these guys would be specialists of sword cane pistols and focus on lightning fast draws…think of them as basically iaijutsu specialists that may treat their weapon as a double weapon…or, if you want to refluff a bit, think of them as gunblade-dudes. Basically, these guys are about range-increase, Lunge and bonus damage to the attack. Pretty cool! The bonded slinger receives an intelligent gun, a so-called soul gun, which can store 1 + Wis-mod grit, gains progressively better enhancements, but also Wis, Int/Cha and Ego. At 3rd level, it begins with the ability to grant Alertness to the wielder, has telepathy and is considered to be unbreakable while it has grit. The gun’s grit pool can grant +1 damage for 1 minute, +1 for every 4 levels. 5th level and every 5 thereafter reduce misfire values and 8th level soulguns may spend grit to teleport their gun to them. 13th level lets them pit their will against their gun, draining grit and gaining it…but only if they pass the ego…oh, and failure fatigues. And yes, teh trasferrence cannot be exploited/cheesed. 17th level lets them fortify themselves with the gun’s ego via grit and 19th level lets the slinger regain grit whenever the guns regains grit. The dread sniper gains Stealth as a class skill and must choose a musket. They halve range increment penalties with it…which is pretty powerful from the get-go. Better sniping via Stealth and damage is unlocked at 5th level and scales. The archetype, however, also has unique deeds centered on remaining unseen and delivering devastating shots when sniping from hiding. The archetype also nets favored terrain and while not every deed’s wording is perfect, the rules language encapsultes well the concept in question. Oh…and guess what: Unlike pretty much every sniper build I have seen, this is neither horribly OP, nor unplayable weaksauce…instead providing a great representation of the concept. Kudos! That being an N. Jolly book, I am not surprised to see the elemental gun, (aka bunduqar) herein: First level nets these guys an elemental focus and simple blast as well as an energy simple blast. (Only elements with energy simple blasts qualify!) They channel elemental energy into their guns, which dissipates after one round and increases misfire by 1. Instead of accepting burn, these guys could potentially pay for burn in grit, which theoretically can be cheesed. I am not a fan here, since grit is a replenishing resource, whereas burn represents an absolute value; grit is unreliable, yes, but still. Starting at 3rd level and every 4 thereafter, the elemental gun may select substance infusions that may be applied to their simple blasts in lieu of deeds, but the DC is 10 + 1/2 class level + Wis-mod and only one infusion may be applied to an attack per round. Surprisingly, the follow-up ability contradicts this hard-cap, suddenly talking about one or more infusions in the context of reducing the total burn cost. This makes me believe that the infusion-cap was supposed to pertain not the total number of infusions per round, but the number of attacks to which infusions can be applied…if so, the wording could be clearer. So…this is basically a laser gun archetype. I like its concept. It’s what my own class is all about…which also makes this hard for me. I kinda expected combo gunplay, you know, fire bullet, have blast shoot forth from impact – mainly because that’s what mine does best. It’s a solid laser gun using the kineticist engine, though it is wording-wise slightly less precise than what I’m accustomed to be the author and it could certainly use some creative tricks. The gunsmoke phantom is about flexibility: They may teleport as a move action via grit and the ability smoke step. As a nitpick, this should specify being a conjuration [teleportation] effect for purposes of suppression. 7th level nets gaseous form (not italicized) and the archetype also gains the option to not provoke AoOs after smoke stepping. Adding a sickening haze emphasizes further the skirmishing focus and is upgraded at higher levels to also feature bludgeoning damage and increased condition severity. Dimensional Dervish similarly is unlocked, though, again, the reference to the dimensional door spell is not italicized. Apart from these formal hiccups, this looks like a powerful skirmishing option, but in play, it may turn out to be quite a bit more powerful than all tables can handle. You see, the main weakness, from an engine point of view of the class is that it needs to get close to targets to unleash its full devastating capabilities, but not too close since it’s not that amazing in melee. This archetype lets you do just that, which, in game exacerbates the issue of the gunslinger’s base engine vs. touch AC simply not scaling that well. There’s a reason pretty much all other vs. AC-classes only have 3/4 BAB…and it’s already bad with them. In short: You’ll get a lot of quasi-guaranteed hits with this guy. High rollers are another concept I enjoy and have tackled myself: It’s a gambler’s archetype, allowing you to increase the damage output to ever higher levels, but at the cost of higher misfire chances. The math underlying the system employed here is solid, which is pretty important for classes that tackle this type of design. Things get a bit more complex at 3rd level, when the archetype may increase the misfire rate by 1 for the first attack in a full-attack or the standard action: Instead of rolling damage, you roll a d6: 1= misfire, 2,3,4 = minimum damage, 5, 6 = maximum damage. This is bad, chance-wise…so you can rig the game by paying 1 grit, only dealing minimum damage on 1 and 2, maximum on 3, 4, 5 and 6. No, you can’t reduce the grit-costs. Interesting one! 7th level unlocks a variant of said gambling shot based on a d8 and, more importantly, at this level, when you deal maximum damage, you may designate your next attack to ALSO be a gambling shot, with grit expended in the triggering first shot also applying to the follow-up attacks…and this is where the math underlying the class falls apart, since the d6 has a 2/3 chance of maxing and the AoO d8 5/8 with spent grit – oh, and an 8 on the d8 regains one point of grit, your average damage output will exceed that of the non archetype’d slinger. Consider the fact that you may, at 11th, spend 2 grit to choose the result…well. You can bleed yourself dry of grit pretty easily, granted, but in the hands of a moderately lucky player (we all have one, right? ), this is nasty. 15th level lets the guy roll 1d2: 1 detonates the firearm, 2 means max damage, +1 grit regain and 1/2 class level temporary hit points. The final ability references a “true gambling shot” – why not reference the deed and instead point towards the shot inside? Anyways, I will not allow this one since it does not fit my playstyle, but if you like very swingy experiences, this may well be the archetype for you. In spite of my complaints, I do appreciate what this one does and the lack of options to cheese the grit regains of the abilities via kittens is a big plus. In short: It is a polarizing archetype. You either love it or hate it. A total of 5 feats can also be found herein: +2 DC for a deed, gain an alternative deed, two improvements for named bullet and a means to use wrist launcher’s in conjunction with the bolt ace tricks. The pdf also contains an enchanted lucky duster and showcases its modifications among the magic items, with elemental scattershot pistols formed after dragons, self-loading sword cane pistols, a large musket usable for smaller folks…pretty nice. The adaptable holster would be a star here, allowing for the flexible application of firearm modifications. Problem: It grants the modification for 24 hours and while a firearm may only benefit from one of these, any number of firearms can be modified with them. I.e. if you put one of them in a garrison, all guards can take turns modifying their guns, thus never requiring the modifications to be applied in a mundane manner. I think the holster should have a cap of how many guns it can affect at any given time. A repairkit that permanently becomes the modification, in comparison, has no such issue and costs a 3rd of the more abuse-worthy holster. Slinger’s Bibles, finally would be basically manuals that grant deeds upon reading them. And yes, there is a hard cap in place here regarding the number of such items you can benefit from. The pdf also features several favored class options for Porphyran races, none of which represent an issue in my book. The pdf concludes with Gun Jaw, a hobgoblin dread sniper at CR 12, who also happens to come with a nice background story and even an NPC-boon, ending this on a high note. Editing and formatting are okay to good – while the rules-language, for the most part, is precise and properly juggles the complex concepts it attempts, there are a couple of instances where the wording could be clearer. On a formal level, there also are a couple of hiccups spread through the pdf. Layout adheres to Purple Duck Games’ 1-column standard in 6” by 9” and the pdf sports quite a few nice full-color pieces of art – some I have seen before, but definitely not all. The pdf comes fully bookmarked for your convenience. 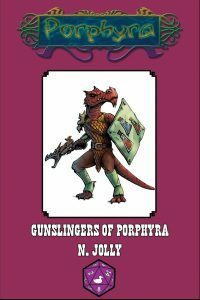 Jolly and Team KOP (Jacob McCoy, Mort & Onyx Tanuki) deliver a book on gunslingers that is more than just an expansion – it is basically a huge attempt to fix several of the grating issues the class faces. For the most part, the pdf succeeds admirably in its endeavors – the pdf addresses the silence/player agenda issues, adds some serious customization to guns and provides several archetypes that allow you to properly play tropes of gunslinging without waiting for x levels to have the cool stuff kick in. At the same time, the pdf takes the gunslinger’s engine and adds onto it – which means it inherits several of the weaknesses and, in some cases, exacerbates them. That being said, for each gunsmoke phantom herein, there is an amazing black powder duelist and the customization options are well-crafted indeed. I had a lot of déjà-vus regarding my own designs while reading this book and this does show that the authors have taken the class an analyzed its components very well. At the same time, I think some of the engine-modifications could have gone a step further…or use some consideration regarding the gunslinger’s already pretty phenomenal accuracy, instead of adding to it. At the same time, this book does go into breadth and significantly expands the array of options available for the gunslinger, which is an excellent thing in my book, even if I disagree with some of them or would have wished for more precision in a couple of instances. It is, frankly, very hard for me to separate this book from the issues inherited by the base class, since, to me, they warranted a creation of a whole new class. That being said, this is probably as far as you can get as a rules band-aid to make the gunslinger work as it should. Ultimately, and this is more important than the for the most part cosmetic hiccups, the gunslinger immensely benefits from the addition of this book and becomes more rewarding to play. It still is a flawed class, but it is less flawed with this book. I’d still strongly advise GMs to take a careful look at some of the archetypes before allowing them in the game and this, combined with the hiccups, ultimately makes me settle on a final verdict of 4.5 stars, rounded down for the purpose of this platform. It may not make me return to the gunslinger, but it sure as hell makes for a better experience than playing without this book. You can get this cool collection of rules to streamline the gunslinger-experience here on OBS!